This Slow Cooker Creamy Lemon Butter Chicken is covered in a creamy sauce made with plenty of lemon, butter and garlic! Serve the sauce over pasta or rice for an easy, delicious dinner! This post is sponsored by Challenge Butter, but all opinions are my own. Since having our twins almost a year ago, life has been busy! My mom was visiting this past weekend and looked at me at one point and said, “Do you realize that you never stop moving? You’re always in motion.” And it’s true. If I’m not working, I’m chasing after two little boys who are moving like crazy these days. It’s busy and fun! So in order to make dinner happen at night amongst all the crazy, the slow cooker has become my best friend. I’ve been making lots of tasty dinners and playing around with recipes and I’m excited to share some of them with you starting with this Creamy Lemon Butter Chicken! 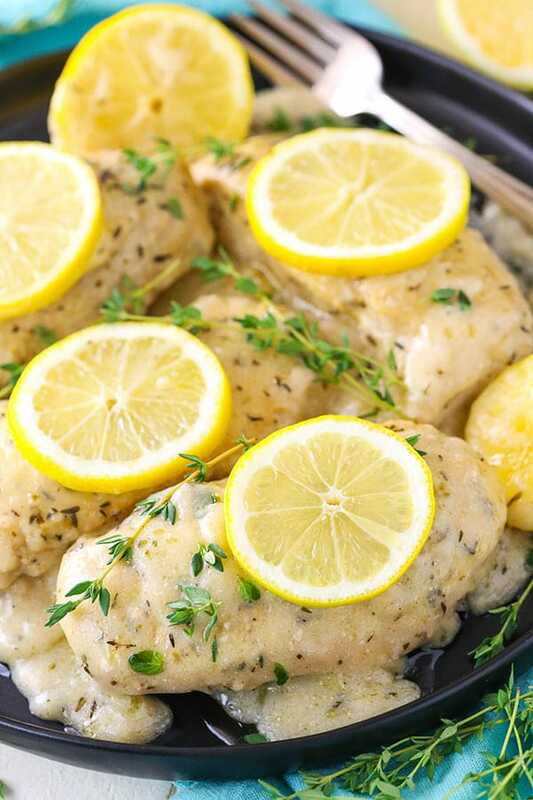 Lemon is one our favorite flavors around here and the boys love anything covered in a tasty sauce, so this chicken has become quite popular in our house. To get started making the chicken, you’ll want to get your slow cooker set up. I’m a fan of using a slow cooker liner to make clean up easier, but that definitely isn’t required. Next, you’ll want to add your chicken to the cooker and make the sauce that the chicken will cook in. It’s important when cooking in a slow cooker to have enough liquid to cook the chicken in to keep it moist. You definitely don’t want it to dry out, so I like to have enough liquid that it comes up at least about half way up the sides of the chicken. My slow cooker is a 6 quart, so even if you have a smaller one, this should be plenty to keep the chicken tender. You’ll start by combining some chicken broth, half and half and lemon juice. The lemon juice adds lots of flavor, the half and half lends creaminess and the chicken broth brings it own flavor, as well as some additional liquid. For additional flavor, we add garlic, salt and pepper, thyme, oregano and paprika. You know I love to have plenty of flavor, and this recipe doesn’t lack in that department! 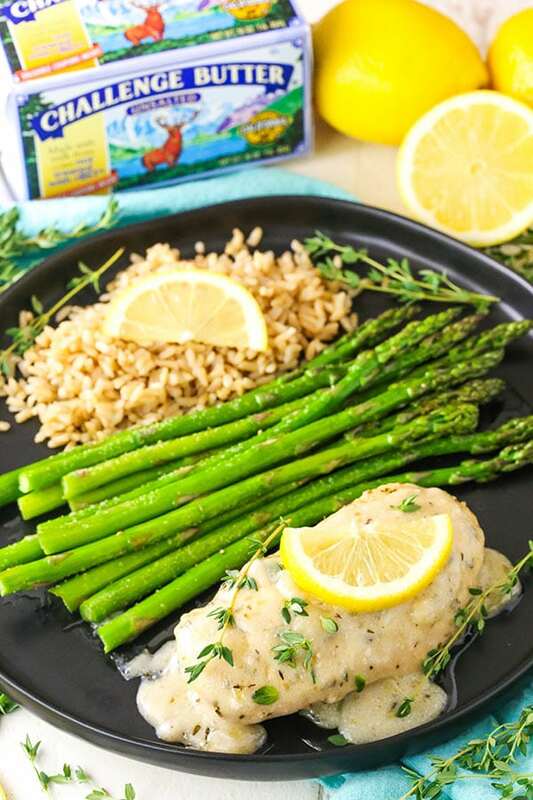 The final thing you’ll add is the melted butter – more “liquid” and definitely more flavor! It’s best to melt the butter before getting started, let it cool a bit and then add it at the end. It helps it incorporate better that way, since some of the other ingredients are cooler and you don’t want the butter to seize up if it’s still really warm when added. 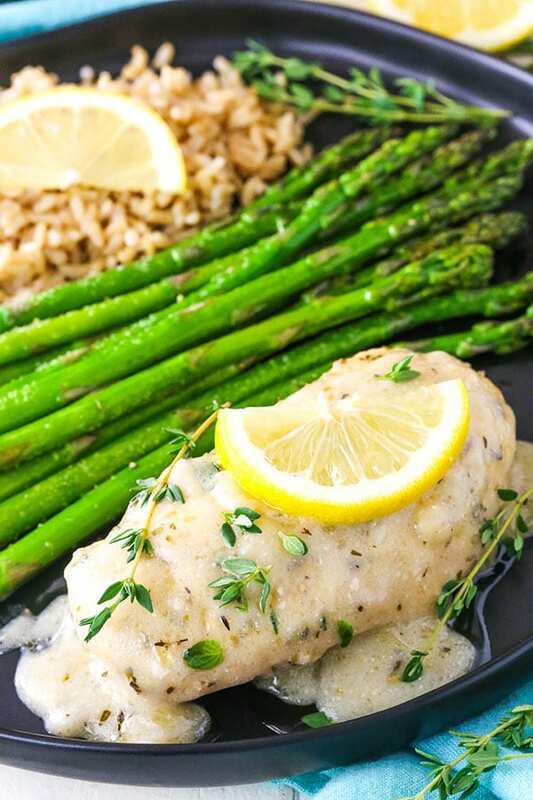 And speaking of butter, I used my favorite in this lemon butter sauce – Challenge Butter! It’s such a creamy butter made from the freshest milk and goes from farm to fridge in just two days. Plus, there aren’t any growth hormones, nor do they use any artificial preservatives, fillers or dyes. These things are more important to me than ever these days, since I always have the boys in mind when cooking. 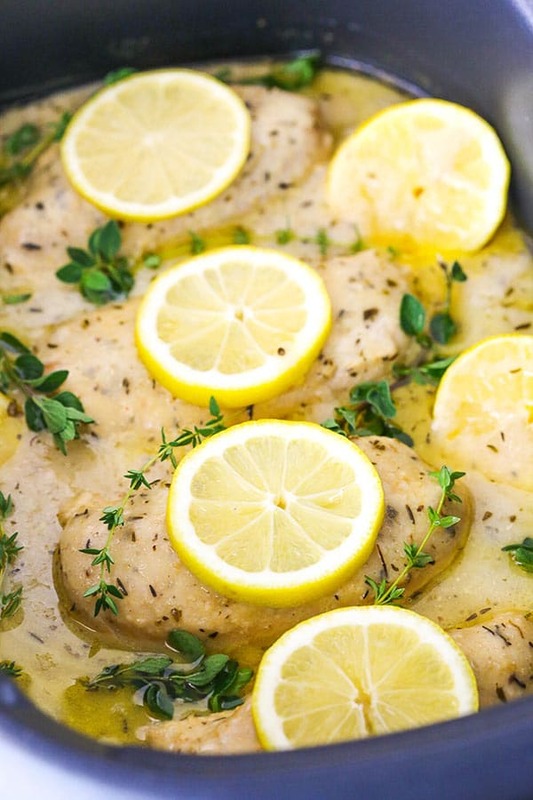 Pour that delicious lemon butter sauce over the chicken and let it cook on high for 3 hours. At that point, remove about 1 cup of the lemon butter sauce and add some cornstarch to it. Pour the mixture back into the slow cooker and stir it around a bit, then let it cook for another hour. When it’s done, you end up with the most creamy lemon butter chicken! The sauce thickens up beautifully and goes so nicely with the chicken. It makes a wonderful sauce not only on the chicken, but also to drizzle over rice, pasta, mashed potatoes or whatever you decide to serve your chicken with. We absolutely love it and make it all the time! So fresh and tasty and such an easy way to put together a great meal! – Pay attention to the amount of liquid in the slow cooker. I use a 6 quart cooker and have the liquid about half way up the sides of the chicken. If use you a smaller cooker and the liquid covers the chicken more than that, that’s fine, but you don’t want it to be less. – Be sure not to overcook the chicken. You can cook this chicken on high for 4 hours or low for 8, but I do think that the chicken is a little more moist when cooked on high for 4 hours. It’s also best to not leave the chicken sitting for took longer after it’s cooked. The heat can continue to cook the chicken as it sits. – The cornstarch really thickens up the sauce so that it’s nice and creamy. You can always adjust it to your liking, if you prefer it a little more or less thick. Keep in mind that the sauce continues to thicken as it cools. 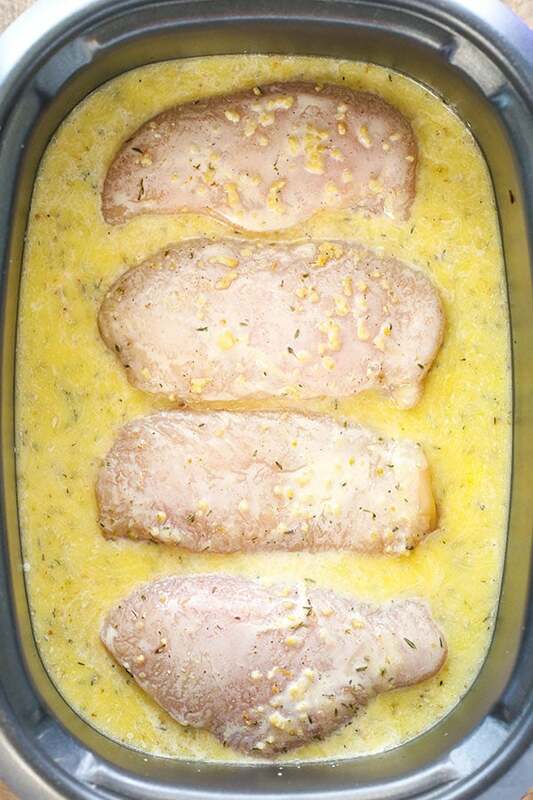 – Serve the creamy lemon butter chicken sauce over rice, pasta or mashed potatoes for a great meal! – Use leftovers for chopping up and adding to salads! 1. Add the butter to a microwave safe bowl and heat until melted. Set aside. 2. 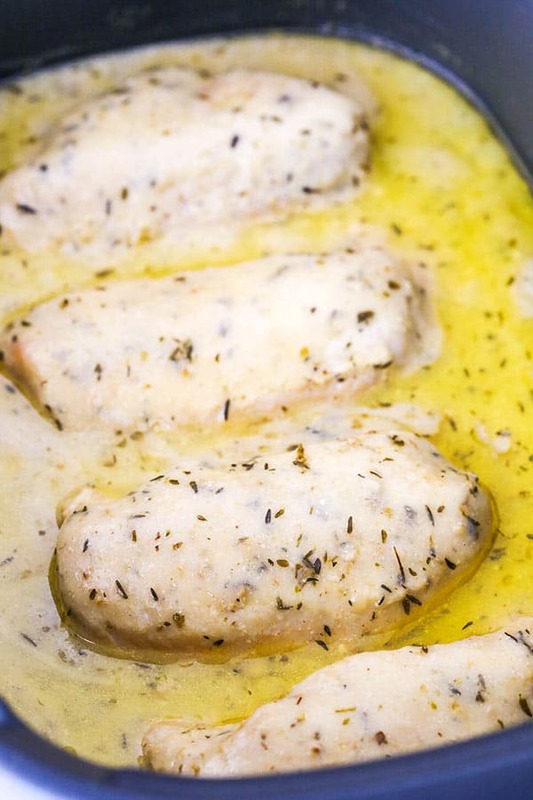 Place the chicken breasts into a 6 quart slow cooker. 3. In a large bowl or measuring cup, combine the chicken broth, half and half and lemon juice, then add the garlic, salt, pepper, thyme, oregano and paprika. 4. Add the melted, cooled butter to the lemon mixture and stir to combine. 5. 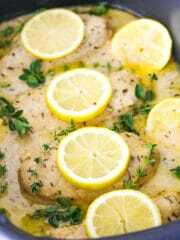 Pour the lemon butter mixture over the chicken, then cover the slow cooker and cook on HIGH for 3 hours or LOW for 7 hours. 6. Remove about 1 cup of the lemon butter mixture from the slow cooker and whisk in the corn starch. Add it back into the slow cooker and stir to combine. 7. Place the top back on the slow cooker and cook for another hour, then serve. Hi Lindsey, when do you add the melted butter? This recipe sounds delicious & I will probably be making tonight for dinner. 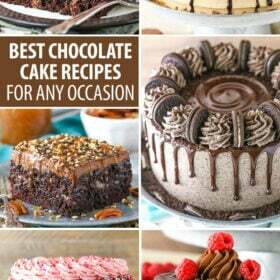 Thank you for all the wonderful recipes I love your blog! In reading the article it sounds like you add the cooled melted butter to the measuring cup with the broth, half and half, etc. but you don’t mention it in the recipe. Just a goof, right. Sounds delicious though. Yes, that’s right. It’s been updated – thanks! How would this work in an Instant Pot?? I actually have never used one so I can’t advise on how to use it that way. What is half and half please? I don’t believe we have this in the UK? It’s half milk, half cream. I am guessing this would be great with fish, as long as it the cooking time is adjusted. I can’t wait to give it a try. I’ve seen a lot of recipes where the meat gets seared first and it adds extra flavor. Have you tried it? Did it work well? I have not tried it with this recipe, but it’s a fairly common thing too. You could definitely give it a try. I’m not sure, but it’s possible that searing it before hand might make it so you want to reduce the cooking time a little bit. Reading the recipe, won’t the lemon juice cause the half and half to curdle and separate? Would love to make it, just worried. I actually wondered about that too when working on the recipe, but it doesn’t. Just be sure to add the ingredients in the order that I listed them. Also, be sure the butter has a chance to cool because that would have a curdle issue because of the temperature difference. I hope you enjoy! Can I make this recipe in an Instant pot? I actually have never used an instant pot, so I can’t advise on how to use it. Think the recipe should have read 4 1/2 tsp, not tbsp cornstarch ?!?!? No, tbsp is correct. But feel free to reduce it if you prefer a thinner sauce. I a cooking this right now- for the very first time. I am confused about the end step. Once I have mixed the cornstarch in and then added the liquid back into the crock pot it says to cook for one more hour- is that regardless of if it is on high or low? Yes, it is. Total cooking time is 4 hours for high, 8 for low. I hope you enjoy it! Oh my gosh this has amazing flavour!! 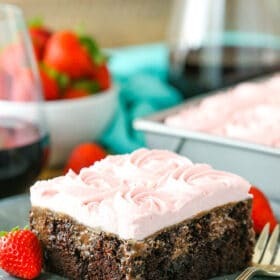 This is the first non baking recipe I’ve tried on this site and I can’t wait to share this with my cooking friends, and even my non cooking friends because it’s so easy and so delicious! I added mini potatoes to the sauce and they picked up the delicious buttery, lemon herby flavour..
what if you dont have a slow cooker, what would the time then be, should it be covered or cooked uncovered? I haven’t bake this particular chicken in the oven, but I would probably bake it uncovered at 350 degrees for roughly 25 minutes. My kids adore capers. Thoughts on adding them to the dish? I haven’t tried it but it sounds like it could be good! All I can say is this was AWESOME! Thank you for sharing. I think you should share more dinner recipes please! Hi, I’m not sure we can get half and half in the UK (although to be fair I haven’t looked! ), can you recommend an alternative please? Half and half is half cream and half milk, so that would work.